Minor repairs here and there were keeping this roof together before our inspection. The crew had to remove the existing layer to insure any ripples were smoothed out before the flat roof membrane was added. We also replaced the rotted plywood and a chimney cricket with reflashing. You were so respectful, quick, and clean. "Labor crews and material delivery were on time and as..."
Roofing101 offers services such as flat roof repair and maintenance and flat roof installations for commercial, industrial and residential customers. We have an experienced team of roofers who can help you select the right type of roof for your home or commercial building, or evaluate your existing flat roof to suggest the proper repairs. Contact us today to schedule an appointment for a free estimate. 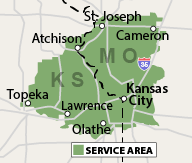 We serve customers in Independence, Overland Park, Kansas City and surrounding Kansas and Missouri areas. Roofing101 is experienced in a wide range of flat roof services for commercial, residential and industrial buildings in Kansas City, Overland Park, Independence, Olathe, Topeka, Saint Joseph, Lees Summit, Shawnee, Blue Springs, Lenexa and nearby towns and cities. It doesn't matter if you are looking for flat roof repair, or installing a new roof; our professionals will inspect your building, go over all of the options, and answer any questions you may have. We take the time to make sure that you are able to make an informed decision when it comes to protecting your home or business. To schedule an appointment for a free quote for flat roof replacement, repair, or installation, give us a call at or send us an email to get started.